Happy birthday to Charles III the Simple of France who was born on this day in 879. His epitaph of Simple in English suggests that Charles’ mental capacity was somewhat limited which seems to be borne out by the fact that Charles was unable to stop the Viking incursions and was forced to cede the region of what would become known as Normandy to Rollo and his men which would have long term implications not just for the history of France, but of England as well. The account of Charles being thrown onto his back by one of Rollo’s men who refused to bend down to kiss the king’s foot seems to capture the impotence of the crown in the face of the Viking threat. The fact is Charles was in part of victim of timing as well as his own ambitions. The ceding of territory to the Vikings was more about realpolitik than necessarily a sign of weakness. Charles saw an opportunity. 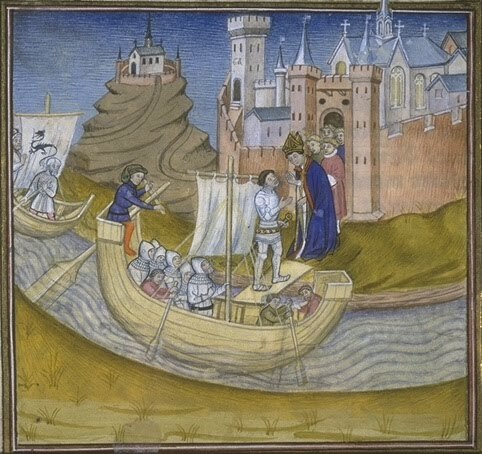 By requiring Rollo to convert to Christianity as one of the conditions of the 911 Treaty of Saint Claire sur Epte, Charles was able to also create a buffer state that would prevent further raids by Viking fleets. Of course, it would take centuries before the monarchy was able to reincorporate the Norman duchy into the royal domains. Rather, the demise of Charles’ reign had more to do with his own nobility who resented his efforts to increase royal power at their expense. They felt particularly betrayed since they had installed him on the throne in the first place so they deposed him in 922, eventually dying in captivity in 929. This was the beginning of the end of the Carolingian line as Robert I, though only ruling for a year before being killed in battle in 923, paved the way for the Capetian monarchy when his grandson, Hughes Capet would found a dynasty that would rule France directly and indirectly through the cadet branches of the Valois and Bourbon line for more than 700 years.